Cincinnati, Ohio, July 24, 2013 – Milacron LLC, a global plastics industry leader with the widest range of plastics processing equipment, technologies and services in the world, has appointed an accomplished organizational development expert and counseling psychologist as Corporate Vice President and Chief Human Resources Officer. The move will help to further accelerate the company’s growth and support its dynamic workforce. Richard A. O’Leary, Ed.D., is nationally recognized for his expertise in a broad array of human resource practices. He is an accomplished speaker, having presented at numerous conferences worldwide on business transformation, innovation, inclusion and best practices in human resources. Additionally, O’Leary has served on the boards of the Best Practice Institute, a think tank dedicated to innovative practices in leadership and management, and The Conference Board’s Executive Council for Talent and Organizational Development, an exclusive forum for executive-level leaders of talent development, organizational development and learning. O’Leary has nearly 30 years of experience as a senior human resources and corporate executive with such industry-leading manufacturers as Corning Incorporated, a maker of specialty glass and ceramics for consumer electronics, as well as Owens Corning, a market-leading innovator of glass fiber technology. He joins Milacron LLC from Iris International Inc., a leading manufacturer of automated diagnostic systems and consumable products for use in hospitals and laboratories, where he served as Corporate Vice President-Human Resources & Administration. O’Leary also is a member of the Adjunct Faculty-Family Practice at the University of Medicine & Dentistry of New Jersey’s School of Osteopathic Medicine. He is the recipient of numerous awards, including the Western Michigan University Distinguished Alumni Award and the Corning Inc. President’s Excellence Award. O’Leary holds a bachelor’s degree in sociology and a master’s degree in counseling from the University of Delaware, as well as a doctorate in counseling psychology from Western Michigan University. Having served since 1987, O’Leary also recently retired from the Delaware Air National Guard State Staff, and holds the rank of lieutenant colonel (retired) in the United States Air Force. Milacron LLC, a privately held company, owned by affiliates of CCMP Capital Advisors LLC, has the widest range of plastics processing equipment, technologies and services in the world. 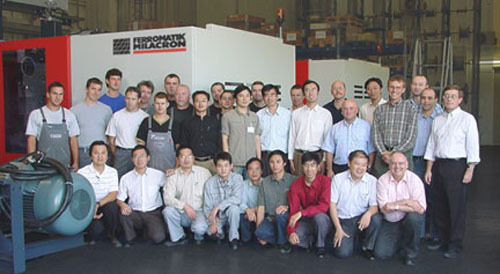 Through its five premier businesses – Milacron Plastics Machinery, Mold-Masters Hot Runner Systems, Milacron Aftermarket, DME Mold Technologies and CIMCOOL® Fluid Technology – it equips customers with exceptional products and services, providing the innovation they need to succeed in today’s complex environment. The company’s more than 4,500 talented employees represent Milacron at every corner of the globe, delivering a competitive advantage to tens of thousands of customers in markets as diverse as the company’s portfolio of solutions.